Connor Tukel wants to make the world a better place — and he's starting with Detroit. Tukel is a junior at Wayne State University majoring in global studies and minoring in public health. He’s part of the MedStart program, a member of the Irvin D. Reid Honors College and a clinical research technician for multiple hospital emergency departments in Detroit. The aspiring doctor is also busy studying for the MCAT. 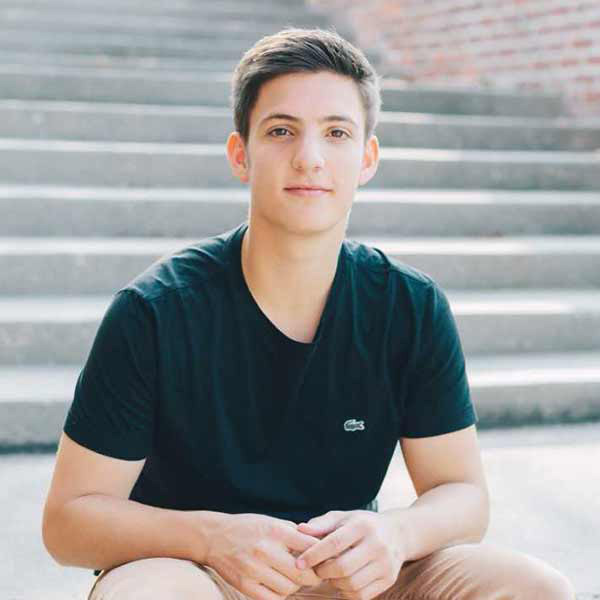 Tukel originally majored in Near Eastern studies because he wanted to understand everything happening in the Middle East, but switched to global studies to broaden his focus and gain an international mindset. "I surprise a lot of people by being in MedStart and not majoring in science, but I'm still taking science classes,” Tukel said. “The combination of the two programs will make me a better, well-rounded doctor." Tukel hopes to one day incorporate his love for technology and medicine into a career. "They're very much interrelated, health, technology and the global aspect,” he said. “I have this down-the-line picture of streamlining the three." Tukel is also passionate about changing people’s views of the city of Detroit. He grew up in Franklin, Michigan, and has always lived in the metro Detroit area. His most recent project was inspired while on vacation. "We met these people from Montreal and when we told them we were from Detroit, they said 'Oh, I'm so sorry.’"
Tukel knows that even with the changes and growth that Detroit has gone through, there are still negative perceptions of the city that he wants to change. "360 Degree Detroit is a project where I'll be using a 360-degree camera to capture Detroit's culture and attractions for people to view in a virtual reality setting." Tukel won a Global Crossroads scholarship to help fund the project, which will be presented in the fall. In the meantime, he is on a waiting list for a new camera. "I could show someone a cool photo of the city, I could describe to them what it's like at a Tigers game or at Eastern Market on a Sunday,” he said. “Or I could just have them put the goggles on; it’s indisputable." Watching 360-degree videos on YouTube has helped Tukel get ideas for his project. "If I can leverage the feeling of being in Detroit to change people's perceptions, that would be pretty cool; that's what I'm ultimately trying to do." If his first video project goes over well, Tukel hopes to come up with more refined ideas and create a website or exhibition for Wayne State to use during events. Tukel believes that this virtual reality technology will soon be implemented in medical schools. "I think for teaching medicine, this could be an extremely powerful tool," he said. Tukel has an Undergraduate Research Opportunities Program grant from the Wayne State that he will be putting toward a project he will be resuming in the fall — medicine delivery by drone. With his friend Albert Jose, an engineering student who currently works in Amazon’s drone delivery department and his brother, Matthew Tukel, a current med school student. "Our theory is that the future of emergency medicine is going to involve drone delivery in some capacity,” Tukel said. “We’re building and testing a drone that will be able to deliver naloxone to the scene of overdoses." Naloxone is a medication used to block the effects of opioids, particularly in the cases of overdoses. Naloxone can be administered intranasally and does not require a medical background to be used, but needs to be administered within a certain time frame; that's where the drones come in. "An ambulance has to drive through traffic, wait and take an indirect route, but a drone can fly over traffic and take the most optimal route to deliver a drug that can save someone's life." Tukel believes that drones will be delivering most of, if not everything, within 10 years. "Even if it's not the delivery of the drugs, it still is a huge tool for first responders in general to use to view a scene and figure out what's going on before they get there." As a junior, Tukel knows he might have graduated by the time this project becomes a reality, but he hopes that one day he can incorporate this technology into his career as a doctor, even as he is still undecided about what kind of doctor that might be. "That's the ultimate question," said Tukel. "I've seen so much working in the Detroit hospitals that I respect the process a lot more than just saying I want to be a certain kind of surgeon. I've got a lot of time and a lot more experiences to figure that out."